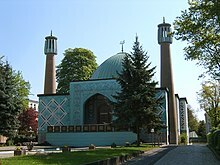 The Wünsdorf Mosque, at the Halbmondlager POW camp, was Germany's first mosque, built in 1915; it was demolished in 1925–26. Owing to labour migration in the 1960s and several waves of political refugees since the 1970s, Islam has become a visible religion in Germany. According to a national census conducted in 2011, 1.9% of Germany's population (around 1.5 million people) declared themselves as Muslim. However, this is likely to underestimate the true number, given that many respondents may have exercised their right not to state their religion. An estimate made in 2015 calculated that there are 4.4 to 4.7 million Muslims in Germany (5.4–5.7% of the population). Of these, 1.9 million are German citizens (2.4%). According to the German statistical office 9.1% of all newborns in Germany had Muslim parents in 2005. Islam is the largest minority religion in the country, with the Protestant and Roman Catholic confessions being the majority religions. There are between 2.1 and 4.7 million Muslims. The large majority of Muslims in Germany are of Turkish origin (63.2%), followed by smaller groups from Pakistan, countries of the former Yugoslavia, Arab countries, Iran and Afghanistan. Most Muslims live in Berlin and the larger cities of former West Germany. 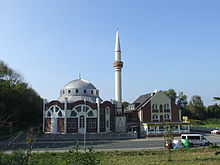 However, unlike in most other European countries, sizeable Muslim communities exist in some rural regions of Germany, especially Baden-Württemberg, Hesse and parts of Bavaria and North Rhine-Westphalia. Owing to the lack of labour immigration before 1989, there are only very few Muslims in the former East Germany. Among the German districts with the highest share of Muslim migrants are Groß-Gerau (district) and Offenbach (district) according to migrants data from the census 2011. The majority of Muslims in Germany are Sunnis, at 75%. There are Shia Muslims (7%) and mostly from Iran. The Ahmadiyya Muslim Community organization comprise a minority of Germany's Muslims, numbering some 35,000 members or a little over 1% of the Muslim population, and are found in 244 communities as of 2013. According to the Huffington Post in February 2018 which quired each of the 15 state justice ministries, 12 300 Muslims are in prison and constitute about 20% of the total 65 000 prison population in Germany which constitutes an over-representation. The highest shares are in city states of Bremen (29%), Hamburg (28%) but the share is high also in large states such as Hessen (26%) Baden-Württemberg (26%). The share is lower in the former East Germany. Muslims first moved to Germany as part of the diplomatic, military and economic relations between Germany and the Ottoman Empire in the eighteenth century. Twenty Muslim soldiers served under Frederick William I of Prussia, at the beginning of the eighteenth century. In 1745, Frederick II of Prussia established a unit of Muslims in the Prussian army called the "Muslim Riders" and consisting mainly of Bosniaks, Albanians and Tatars. In 1760 a Bosniak corps was established with about 1,000 men. In 1798 a Muslim cemetery was established in Berlin. The cemetery, which moved in 1866, still exists today. The German section of the World Islamic Congress and the Islam Colloquium, the first German Muslim educational institution for children, were established in 1932. At this time there were 3,000 Muslims in Germany, 300 of whom were of German descent. The Islamic Institut Ma’ahad-ul-Islam was founded in 1927 and is now known under the name "Zentralinstitut Islam-Archiv-Deutschland" (Central Islamic Archive Institute). 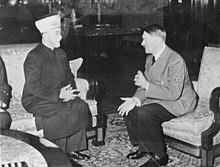 The Grand Mufti of Jerusalem Haj Amin al-Husseini energetically recruited Muslims for the SS (Schutzstaffel), the Nazi Party’s elite military command. He recruited Muslim volunteers for the German armed forces and was involved in the organization and recruitment of Muslims into several divisions of the Waffen SS and other units. After the West German Government invited foreign workers ("Gastarbeiter") in 1961, the figure sharply rose to currently 4.3 million within two decades (most of them Turkish from the rural region of Anatolia in southeast Turkey). They are sometimes called a parallel society within ethnic Germans. In 2017, Muslims and Islamic institutions were targeted by attacks 950 times, where houses are painted with Nazi symbols, hijab-wearing women are harassed, threatening letters are sent and 33 people were injured. In nearly all cases, the perpetrators were right-wing extremists. In May 2018 a court in Berlin upheld the right to the state's neutrality principle by barring a primary school teacher from wearing a headscarf during classes, where the court spokesman stated that children should be free of the influence that can be exerted by religious symbols. According to a study in 2018 by Leipzig University, 56% of Germans sometimes thought the many Muslims made them feel like strangers in their own country, up from 43% in 2014. In 2018, 44% thought immigration by Muslims should be banned, up from 37% in 2014. In December 2018, the government of Germany strengthened the control of Saudi, Kuwaiti and Qatari funding for radical mosque congregations. The measure was recommended by an anti-terrorist agency in Berlin (German: Terrorismus-Abwehrzentrum) which since 2015 had started to monitor Safalist proselytizing funding in the wake of the European migrant crisis to prevent refugees from becoming radicalized. Henceforth Gulf authorities are required to report payments and funding to the German Federal Foreign Office (German: Auswärtigen Amt). In December 2018, there were no official statistics on how much funding mosques in Germany received from abroad. Only a minority of the Muslims residing in Germany are members of religious associations. 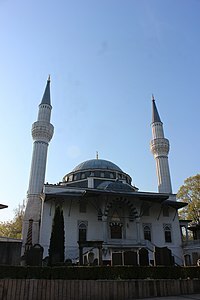 Diyanet İşleri Türk İslam Birliği (DİTİB): German branch of the Turkish Presidency for Religious Affairs, Cologne. As of 2016, the Turkish government funds and provides staff for 900 of Germany's roughly 3000 mosques run by DİTİB. In addition there are numerous local associations without affiliation to any of these organisations. Two organisations have been banned in 2002 because their programme was judged as contrary to the constitution: The "Hizb ut-Tahrir" and the so-called "Caliphate State" founded by Cemalettin Kaplan and later led by his son Metin Kaplan. Islamische Gemeinschaft der schiitischen Gemeinden Deutschlands (IGS): Head organization that unite all Shiite mosques and associations in Germany, with being the Islamic Centre Hamburg the most important Shia mosque in Germany. Al-Mustafa Institut Berlin: A branch of the Al-Mustafa International University in Qum, Iran to Islamic theology to students in Germany and Europe. Ahmadiyya Muslim Jamaat Deutschland K.d.ö.R. : German branch of the worldwide Ahmadiyya Community. There is no ethnicity or race associated with this community although most of the members of the community residing in Germany are of Pakistani origin. The Ahmadiyya Community was established in Germany in 1923 in Berlin and is one of the largest in Europe. Communities exist in Baden-Württemberg, Lower Saxony, North Rhine-Westphalia, Hesse and Bremen. Lahore Ahmadiyya Movement: German branch of the worldwide Lahore Ahmadiyya Movement. Ibn Ruschd-Goethe mosque in Berlin was founded by Seyran Ateş. The liberal mosque has been condemned by the Turkish religious authority and the Egyptian Fatwa Council at the Al-Azhar University. King Fahd Academy, sponsored by Saudi Arabia. The school was closed at the end of the 2016/2017 school year, after long-running criticism that it was attracting Islamists to Germany. According to the FFGI at Goethe University Frankfurt, wahhabist ideology is spread in Germany as in other European country mostly by an array of informal, personal and organisational networks, where organisations closely associated with the government of Saudi Arabia such as the Muslim World League (WML) and the World Association of Muslim Youth are actively participating. The A-Nur-Kita preschool was closed in February 2019 due to its parent organisation, the mosque association Arab Nil Rhein in Mainz propagated material from the Muslim Brotherhood and salafist ideology. Therefore the parent association was incompatible with the constitution of Germany. This was the first time authorities closed any preschool in Rhineland-Palatinate (German: Rheinland-Pfalz). A-Nur-Kita was the first and only Muslim preschool in Rhineland-Palatinate. As elsewhere in Western Europe, the rapid growth of the Muslim community in Germany has led to social tensions and political controversy, partly connected to Islamic extremism, and more generally due to the perceived difficulties of multiculturalism and fears of Überfremdung. A 2017 study on Jewish perspectives on antisemitism in Germany by Bielefeld University found that individuals and groups belonging to the extreme right and extreme left were equally represented as perpetrators of antisemitic harassment and assault, while the largest part of the attacks were committed by Muslim assailants. The study also found that 70% of the participants feared a rise in antisemitism due to immigration citing the antisemitic views of the refugees. In the German federal states with the exception of Bremen, Berlin and Brandenburg, lessons of religious education overseen by the respective religious communities are taught as an elective subject in state schools. It is being discussed whether apart from the Catholic and Protestant (and in a few schools, Jewish) religious education that currently exists, a comparable subject of Islamic religious education should be introduced as a regular part of the curricula. In several states, trials for Islamic religious education are being conducted, while in the states of Hessen, Lower-Saxony and Northrhine-Westphalia, Islamic religious education already is integrated as a regular class. The problem that the cooperation with Islamic organisations is hampered by the fact that none of them can be considered as representative of the whole Muslim community. The construction of mosques is occasionally resisted by anti Muslim reactions in the neighbourhoods concerned. For example, in 2007 an attempt by Muslims to build a large mosque in Cologne sparked a controversy. 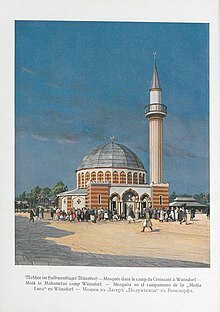 Similarly with the Sendlinger Mosque Controversy, and the proposed construction of a training academy in Munich, originally called the "Centre for Islam in Europe, Munich" (ZIE-M), and later the "Munich Forum for Islam". In 2010, the German Ministry of Education and Research established Islamic Theological Studies as an academic discipline at public universities in order to train teachers for Islamic religious education and Muslim theologians. Since then, Islamic theological departments have been established at several universities, conducting research and teaching on Islam from a theological perspective. Concerns of Islamic fundamentalism came to the fore after September 11, 2001, especially with respect to Islamic fundamentalism among second- and third-generation Muslims in Germany - the Hamburg cell, which included Mohamed Atta, was prominent in the planning and execution of the September 11 attacks. Also the various confrontations between Islamic religious law (Sharia) and the norms of German Grundgesetz and culture are the subject of intense debate. German critics include both liberals and Christian groups. The former claim that Islamic fundamentalism violates basic fundamental rights whereas the latter maintain that Germany is a state and society grounded in the Christian tradition. According to a 2007 Federal Ministry of the Interior report almost half of all young Muslims in Germany support fundamentalist views. About 12% of Muslims in Germany identified with moral-religious criticism against Western societal values in combination with corporal punishment up to and including the death penalty. According to a 2012 poll, 72% of the Turks in Germany believe that Islam is the only true religion and 46% wish that one day more Muslims live in Germany than Christians. According to a 10-year survey by the University of Bielefeld, which dealt with different aspects of attitudes to Islam, "distrust" of Islam is widespread in Germany with only 19 percent of Germans believing that Islam is compatible with German culture. According to 2013 study by Social Science Research Center Berlin, two thirds of the Muslims interviewed say that religious rules are more important to them than the laws of the country in which they live, almost 60 percent of the Muslim respondents reject homosexuals as friends; 45 percent think that Jews cannot be trusted; and an equally large group believes that the West is out to destroy Islam (Christian respondents’ answers for comparison: As many as 9 percent are openly anti-Semitic; 13 percent do not want to have homosexuals as friends; and 23 percent think that Muslims aim to destroy Western culture). According to a 2012 poll, 25% of the Turks in Germany believe atheists are inferior human beings. Salafists strive to live exclusively according to the Quran. According to German authorities, Salafism is incompatible with the principles codified in the Constitution of Germany, in particular democracy, the rule of law and a political order based on human rights. According to the German security service, the Salafist movement attracts rising numbers. In 2011 there were an estimated 3800 Salafists in Germany, which rose to 10300 in September 2017. According to head of security office Hans-Georg Maaßen, the Salafist scene in Germany is not dominated by any one single individual, but instead a great many persons have to be monitored. According to German Federal Agency for Civic Education, the Salafist movement in Germany is centered in the Frankfurt Rhine-Main metropolitan area, North Rhine-Westphalia and Berlin. In these areas, mosques and charismatic imams are the driving factors behind recruitment to the Salafist movement. In 2016, the interior ministry of North Rhine-Westphalia reported that the number of mosques with a Salafist influence had risen from 30 to 55, which indicated both an actual increase and improved reporting. In February 2017, the German Salafist mosque organisation Berliner Fussilet-Moscheeverein was banned by authorities. Anis Amri, the perpetrator of the 2016 Berlin truck attack, was said to be among its visitors. In March 2017, the German Muslim community organisation Deutschsprachige Islamkreis Hildesheim was also banned after investigators found that its members were preparing to travel to the conflict zone in Syria to fight for the Islamic State. According to the Federal Agency for Civic Education, these examples show that Salafist mosques not only concern themselves with religious matters, but also prepare serious crimes and terrorist activities. Turkish and Kurdish Islamist groups are also active in Germany, and Turkish and Kurdish Islamists have co-operated in Germany as in the case of the Sauerland terror cell. Political scientist Guido Steinberg stated that many top leaders of Islamist organizations in Turkey fled to Germany in the 2000s, and that the Turkish (Kurdish) Hizbullah has also "left an imprint on Turkish Kurds in Germany." Also many Kurds from Iraq (there are about 50,000 to 80,000 Iraqi Kurds in Germany) financially supported Kurdish-Islamist groups like Ansar al Islam. Many Islamists in Germany are ethnic Kurds (Iraqi and Turkish Kurds) or Turks. Before 2006, the German Islamist scene was dominated by Iraqi Kurds and Palestinians, but since 2006 Kurds and Turks from Turkey are dominant. In 2016, the German security service estimated that about 24 000 Muslims were part of Islamists movements in Germany, of which 10 000 belonged to the Salafist scene. In 2016, 90 mosques were monitored by the Federal Office for the Protection of the Constitution for their islamist ideology. These were mostly Arabic-language "backyard mosques" where self-appointed imams exhorted their followers to wage jihad. Since the start of 2017 until April 2018, 80 Islamist extremists without German citizenship were deported to their home countries. In March 2018, there were 760 islamists in Germany classified as dangerous by police authorities, of which more than half were on German territory and 153 of the latter were in prison. In July 2010, Germany outlawed the Internationale Humanitäre Hilfsorganisation e.V. (IHH Germany), saying it had used donations to support Hamas, which is considered by the European Union and Germany to be a terrorist organization, while presenting their activities to donors as humanitarian help. German Interior Minister Thomas de Maiziere said, "Donations to so-called social welfare groups belonging to Hamas, such as the millions given by IHH, actually support the terror organization Hamas as a whole." IHH e.V. was believed by the German Authorities to have collected money in mosques and to have sent $8.3 million to organizations related to Hamas. Studies show that while not all Muslims are religious, Muslim youths are markedly more religious than non-Muslim youths. A study comparing Turkish Muslim youths living in Germany and German youth found that the former were more likely to attend religious services regularly (35% versus 14%). 41% of young Turkish Muslim boys and 52% of the girls said they prayed "sometimes or regularly"; 64% of boys and 74% of girls said they wanted to teach their children religion. Atif Bashir, footballer, plays for Barry Town in the Welsh Football League First Division. Ibrahim El-Zayat a European Muslim activist in Germany and has been a functionary in many important Islamic organizations in Germany, Europe, and Saudi Arabia. Mouhanad Khorchide, Professor for Islamic theology at the University of Münster. ^ "Census reveals German population lower than thought". BBC News. 31 May 2013. Retrieved 31 May 2013. ^ (www.dw.com), Deutsche Welle. "Studie: Deutlich mehr Muslime in Deutschland - DW - 23.06.2009". DW.COM. Retrieved 3 April 2018. ^ "Germany". Berkley Center for Religion, Peace, and World Affairs. Archived from the original on 12 October 2013. Retrieved 29 December 2011. ^ "Kartenseite: Muslime in Deutschland - Landkreise". kartenseite.wordpress.com. 5 April 2017. Retrieved 26 April 2017. ^ "Allahs Kinder hinter Gittern: Warum in deutschen Gefängnissen so viele Muslime sitzen". HuffPost Deutschland (in German). 1 February 2018. Retrieved 1 December 2018. ^ "emz-berlin.de". www.emz-berlin.de. Retrieved 3 April 2018. ^ Sam Roberts (December 2010). "Declassified Papers Show U.S. Recruited Ex-Nazis". New York Times. Retrieved 3 January 2011. ^ WELT (3 March 2018). "Innenministerium: Fast tausend Angriffe auf Muslime in nur einem Jahr". DIE WELT. Retrieved 24 November 2018. ^ (www.dw.com), Deutsche Welle. "Germany: Berlin court backs headscarf ban for teacher | DW | 09.05.2018". DW.COM. Retrieved 10 May 2018. ^ Lipkowski, Clara; (Grafik), Markus C. Schulte von Drach (7 November 2018). "Die Deutschen werden immer intoleranter". sueddeutsche.de (in German). ISSN 0174-4917. Retrieved 17 November 2018. ^ a b Welle (www.dw.com), Deutsche. "Berlin will ausländische Moschee-Finanzierung stoppen | DW | 27.12.2018". DW.COM (in German). Retrieved 29 December 2018. ^ Germany, Süddeutsche de GmbH, Munich. "Bundesregierung will Geldflüsse an radikale Moscheen kontrollieren - Panorama-News". Süddeutsche.de (in German). Retrieved 29 December 2018. ^ "Old Faultlines". The Economist. 6 August 2016. Retrieved 9 August 2016. ^ Breyton, Ricarda (23 June 2017). "Ibn-Rushd-Goethe-Moschee: Seyran Ates sieht liberale Muslime bedroht". DIE WELT. Retrieved 30 April 2018. ^ Oltermann, Philip (25 June 2017). "Liberal Berlin mosque to stay open despite fatwa from Egypt". the Guardian. Retrieved 30 April 2018. ^ Breitenbach, Dagmar (29 August 2016). "Controversial Saudi school in Bonn to close". Deutsche Welle. Retrieved 30 August 2016. ^ Biskup, Lennart (2017). Saudi-Arabiens radikalisierender Einfluss auf Deutschlands Muslime (PDF). Frankfurt: Frankfurter Forschungszentrums Globaler Islam (FFGI). pp. 11 / Konklusion. Archived from the original (PDF) on 9 June 2018. ^ WELT (11 February 2019). "Al-Nur-Kita: Einzige muslimische Kindertagesstätte in Rheinland-Pfalz muss schließen". Retrieved 13 February 2019. ^ "Germany". Berkley Center for Religion, Peace, and World Affairs. Archived from the original on 12 October 2013. Retrieved 29 December 2011. See drop-down essay on "Religious Freedom in Germany"
^ "Proposed Bavarian Islamic Academy Highlights Challenges of Muslim Integration". 18 December 2007. Retrieved 3 April 2018 – via WikiLeaks PlusD. ^ "Studie des Innenministeriums: „Viele junge Muslime gewaltbereit"". FAZ.NET (in German). ISSN 0174-4909. Retrieved 24 November 2018. ^ "Islamic fundamentalism is widely spread - WZB". www.wzb.eu. Retrieved 3 April 2018. ^ "Salafismus". www.verfassungsschutz.bayern.de (in German). Retrieved 22 July 2018. ^ "Salafistische Bestrebungen Inhalte und Ziele salafistischer Ideologie". BfV. Archived from the original on 15 January 2018. Retrieved 22 July 2018. ^ Online, FOCUS. "Gewaltbereite Islamisten: Erstmals mehr als 10.000 Salafisten in Deutschland". FOCUS Online (in German). Retrieved 22 July 2018. ^ a b c Jaschke, Hans-Gerd. "Orte der islamistischen Radikalisierung | bpb". bpb.de (in German). Retrieved 1 December 2018. Die beiden Verbote zeigen, dass in salafistischen Moscheen nicht nur auf religiöse Art rekrutiert und agiert wird, sondern in einigen von ihnen schwere Straftaten bis hin zu terroristischen Aktionen geplant wurden. ^ ONLINE, RP. "Verfassungsschutz: Salafisten agitieren in NRW in 55 Moscheen". RP ONLINE (in German). Retrieved 18 November 2018. ^ "Verfassungsschutz beobachtet etwa 90 Moscheen in Deutschland". sueddeutsche.de (in German). 2016. ISSN 0174-4917. Retrieved 18 November 2018. ^ Flade, Florian (4 May 2018). "Justiz: Top-Gefährder aus Hessen abgeschoben". DIE WELT. Retrieved 5 May 2018. ^ (www.dw.com), Deutsche Welle. "Bundeskriminalamt zählt 760 islamistische Gefährder | DW | 31.03.2018". DW.COM (in German). Retrieved 10 May 2018. ^ a b "Germany bans group accused of Hamas links". ynetnews.com. 7 December 2010. Retrieved 3 April 2018. ^ a b DPA (12 July 2010). "Germany Outlaws Charity Over Alleged Hamas Links". Haaretz. Retrieved 3 April 2018 – via Haaretz. ^ The Christian Science Monitor (17 May 2012). "German universities move to train next generation of imams". The Christian Science Monitor. Retrieved 30 June 2015. ^ "Protests in northern German city against Salafist preacher Vogel". Deutsche Welle. Retrieved 30 October 2016. ^ Larson, Taylor (4 August 2017). "BREAKING FOOTAGE Shows the Arrest of 16 Year Old ISIS Sniper Linda Wenzel, a German Schoolgirl". Squawker. Archived from the original on 20 August 2017. Retrieved 19 August 2017. Amir-Moazami, Schirin (December 2005). "Muslim Challenges to the Secular Consensus: A German Case Study". Journal of Contemporary European Studies. 13 (3): 267–286. doi:10.1080/14782800500378359.